Heat and humidity can be a dangerous combination in the outdoors. The StrikeAlert HD Field is the only portable lightning detector which monitors heat stress as well as potential lightning danger. No other portable detector gives you this information in one package. StrikeAlert HD Field measures how it really feels when relative humidity is factored with actual temperature. Easy-to-read display shows when conditions become dangerous. Now, with the HD Field, you can stay informed about current conditions and how they measure up to the four Heat index warning levels. Our StrikeAlert HD is an extension of the trusted StrikeAlert Lightning detection technology, but with advanced usability features. StrikeAlert HD is the first personal lightning detector with an intuitive graphical display that shows you the lightning strike distance as well as a 1-hour storm trend. 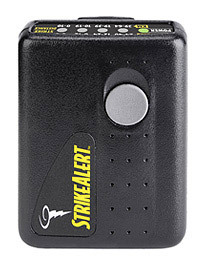 StrikeAlert HD has both audible and vibrate warnings, and achieves up to 80 hours of operation from two AA batteries. The personal lightning detector that started it all! StrikeAlert is the most trusted name when it comes to convenient, dependable and easy-to-use personal lightning detection. StrikeAlert provides an early warning of approaching lightning strikes, and lets you know if the storm is coming your way. The detector is housed in a small pager-like casing that can be clipped on a belt loop. Lightning kills more people on an annual basis than tornadoes, hurricanes or winter storms - so play it safe outdoors! Whether you're on the golf course, hiking or biking, or the kids are on the soccer field, use a StrikeAlert personal lightning detector to give you an early warning of the storm. Heat is the leading weather-related killer in the US and the rates are on the rise. Heat stroke from exercise is one of the 3 leading causes of sudden death in sports activities. 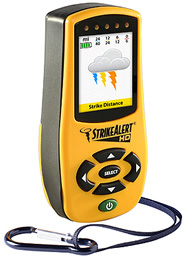 The StrikeAlert HD Field couples heat index monitoring with lightning detection providing the tool you need to play it safe outdoors! StrikeAlert, StrikeAlert HD, and StrikeAlert HD Field are portable detectors that detect lightning up to 40 miles away and tells you whether the storm is coming toward you or not. 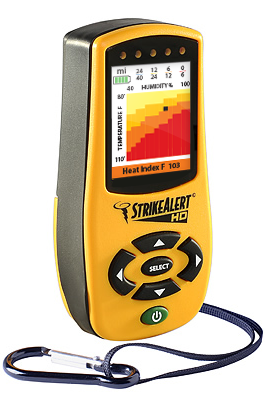 StrikeAlert HD Field adds the capability to monitor the heat risk. Whether working, exercising, or playing outdoors, use a StrikeAlert to provide you with early warning of dangerous weather conditions. ©2000-2018 Outdoors Technologies, Inc. All rights reserved.